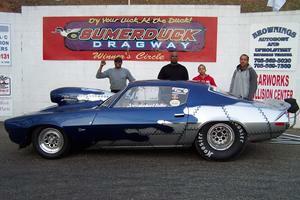 Sunday, April 3, Sumerduck Dragway was the first SOTS race of 2011. Sunday�s race was a rain date for Saturday, April 2 and there was an attendance of 28 cars of a current membership of 53 with 8 joining on race day. This made it an all run field, however 2 broke leaving 1st round running 26 cars. Greg Bruce was the #1 qualifier in both 1st and 2nd qualifying runs with .4685 and .4680. Jerry Williams had the fastest MPH with 151.89. #2 qualifier was Mike Dodson followed by Jerry Williams, Phil Stewart and SOTS President, Gary Pitts. Herbert Talley was the winner of the 1st SOTS race of the 2011 season and went on to runner-up in Top ET when unfortunately his car wouldn�t start for final round against Jeff Buckner. Way to go Herbert! Sunday, April 17, Colonial Beach was the second SOTS race for 2011. It was a very interesting day all around since Colonial Beach ran a two day event in one day with having to cancel Saturday�s race due to the stormy weather. Sunday�s weather was great, sunny and high temps around 70 degrees with a nice breeze. SOTS had a 36 car attendance of the current 53 members which is a 68% turnout. There were 3 previous members rejoining and 1 new member taking our membership up to 57. We had an all run field however, since unfortunately 6 cars broke during qualifying. Greg Bruce was the # 1 qualifier in both 1st and 2nd qualifying runs with 4.643 and 4.645 followed by Mike Dodson (4.704 & 4.716), Jerry Williams (4.821 & 4.832) and David Weedon (4.835 & 4.849). Greg rolled over into Super Pro and was runner-up to Delante Green who is also a SOTS member who bought back into Super Pro after his first round lose in Top Sportsman. Way to go TEAM!!! 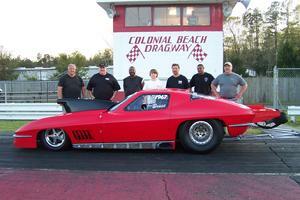 Saturday, May 21 Colonial Beach Dragway, 4th SOTS race of 2011. Saturday�s weather was sunny, humid with temperatures in the lower 80�s. Attendance was 36 of the current 70 members with 2 new members joining making SOTS membership stronger at 72 and a 50% member turnout. Ronnie Hov had the best qualifying run with a 4.665 followed by Greg Bruce�s 4.669, Mike Dodson�s 4.776 and Jerry Williams 4.857. The bump for the 32 car field was a 5.54 but after 2 cars experienced problems/broke and couldn�t run the bump ended up a 5.587. Phil rolled over into Super Pro and took the win plus the side pot. Way to go Phil! Saturday, June 11, 2011 - Sumerduck Dragway. Race #5 of the 2011 season and Mother Nature graced the track with 3 storms. The first two as the track opened and the track personnel did a great job drying off the track. The third storm came before fourth round was run causing the race to be called. Turn-out for this SOTS race was 30 members with Sherman Terrell and Eric Donovan joining bringing SOTS membership up to 74.